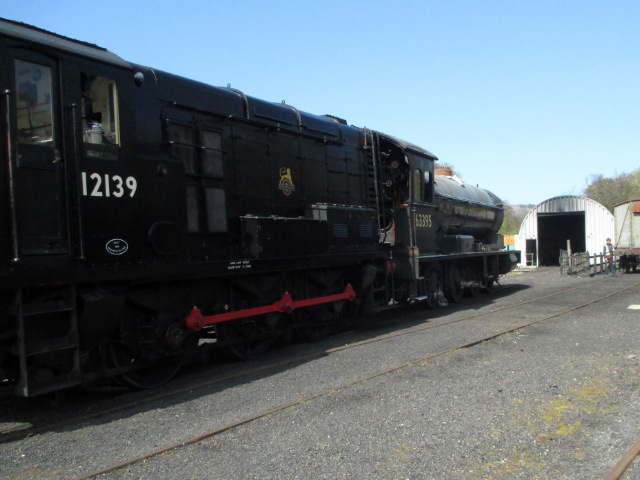 Anyway, after the usual cup of tea, Peter and Ian moved the 24 superheater elements from No 6 road to the outside of Deviation Shed by No 8 road, with a little help from two shed cleaners which was very much appreciated. Shed fitters and Chris Cubitt then cleared the rest of the track area (including the removal of the velocipede and crates of parts from No 29) ready for the move of No 5 to enable removal of the Drewry shunter the next day. This will involve P/W slewing the track in view of the continuing absence of a replacement point for the one that was broken 18 months ago. Once the Drewry has been moved out, No 5 will go back in on No 6 road and be joined by the chassis of 80135 for temporary storage. The Great Marquess was then to be moved to outside the Shed on No 6 road. In the meantime Peter and Ian set about removing the remaining dozen split pins from the spring hanger castle adjusting nuts, and continued after lunch with the last few stubborn split pins. But there was still one obstinate split pin to remove from the front L/H leading by the time the shunter came to move the Q6 to the wheel drops. Whilst that was going on, I cleaned the last 3 top hand hole doors and they are now on the work bench at the back of the workshop. Ian also put 2 more underkeep pads in to soak. After setting the Q6 on the wheel drops, 2 large jacks were acquired, along with a couple of wooden blocks, and the alloy beam on which they are set was dragged up to the wheel drop shed with help from the shed staff. The weight of the Q6 is just slightly on the jacks under the cab. Shaun Bowler, a shed fitter was assisting us in setting this up, but before we could jack up the locomotive to take the weight off the springs, we needed to pack the axle boxes to avoid them being damaged. The MPD has a box full of packing pieces, made specially for this job, but, in spite of exhaustive searches of the MPD, they could not be found. The job therefore had to be abandoned. Shaun was going to cut some new ones the next day and start to remove the springs. Once they are off, it is intended to move the Q6 to the back of No 4 road, lift it using the NYMR Mattison jacks, and remove the wheels and axle boxes. Once that has been done, the axle boxes can be examined and any necessary remedial work agreed. Back at Deviation Shed, the Weltrol with the boiler from No 29, and its frames, have been put into No 5 road to join the Q6 tender. While all this was going on, another coat of paint was put on to the tender of 825 by John Furness, and Chris Parrish said he would be hoovering up all the dust that had been deposited on the Q6 parts when the tender sides were originally rubbed down for painting. There is no working party on Saturday, so the next Q6 session is on Wednesday 10 May, when there may be springs to remove if the Q6 is still on the wheel drops. Paul Middleton was anxious to get it off as quickly as possible however, in case one of the service locomotives suffered a broken spring which needed urgently replacing, so we could find it in No 4 road with wheels to remove. Either way, the Channel 5 TV documentary team who are currently filming on the NYMR, are very keen to film that operation, so if you want to become a TV star, come and join the Wednesday team next week. Still plenty of tea and biscuits if winter returns!